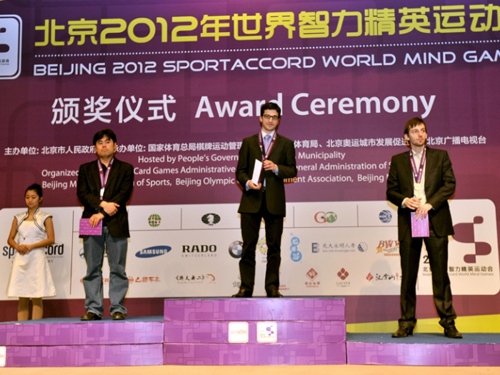 The 2012 World Minds Sports Games in progress in Beijing, China. This unique tournament will feature five sports including bridge, go, draughts, xiangqi (Chinese chess) and international chess. This tournament features an number of top players in each of these mind sports competing in different categories. For chess, it will be rapid, blitz and blindfold. Some of the chess players headlining this event are: Levon Aronian (Armenia), Teimour Radjabov (Azerbaijan), Sergey Karjakin (Russia), Hikaru Nakamura (USA) and Alexander Morozevich (Russia). For the women Hou Yifan (China), Anna Muzychuk (Slovenia), Koneru Humpy (India), Zhao Xue (China) and Kateryna Lahno (Ukraine). Medal winners from Rapid (L-R): Hikaru Nakamura (USA), silver; Laurent Fressinet (France) – gold; Alexander Grischuk (Russia) – bronze. 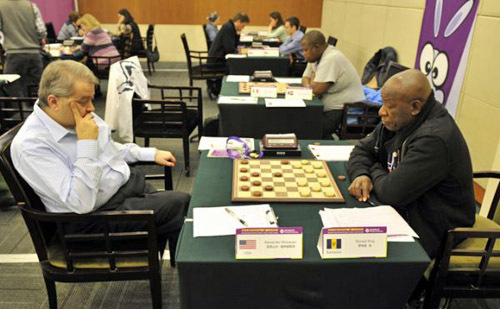 Photo courtesy of http://www.worldmindgames.net/en/photos/. Check the draughts action 05:20-09:09 between GM Jean Marc Ndjofang (Cameroon) – GM Alexander Baljakin (Netherlands), 1/2-1/2. Even though I like chess better than draughts, I have come to appreciate that it is a wonderful game. Draughts is a fascinating mind sport. Once I found out about the Man vs. Machine match with GM Diaga Samb of Senegal, I started doing research. I had heard of former World Champion Baba Sy of Senegal, but only from a vague reference from Charles Covington. I then went on the FMJD discussion board and started discussing African players and everyone was so helpful… even to a chess person. 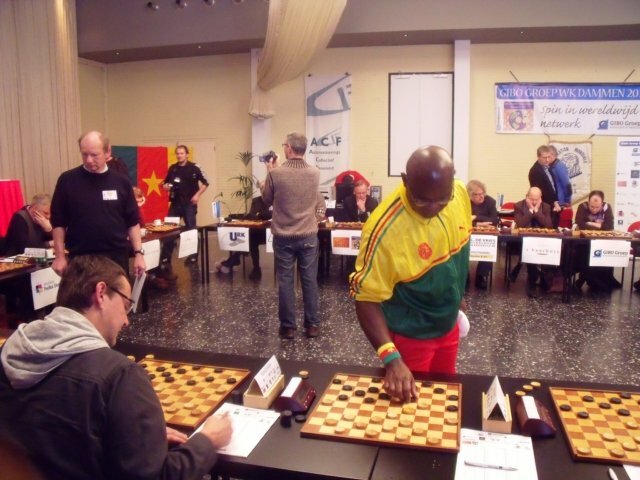 Now I am interested in GM Jean-Marc Djofang of Cameroon, the African Champion. He is about #32 in the world and not the top-rated African player, but is considered an elite player and Africa’s best. GM Jean-Marc Djofang breaking a simul record in 2008. 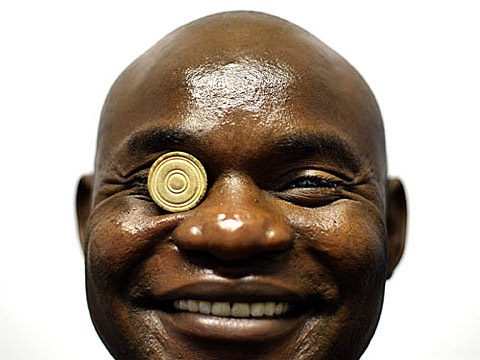 Here is the link to the discussion on Baba Sy (pronounced “see”). You will see my comments throughout. There are eight pages. I am wondering why shogi is not a part of the mind games? Perhaps they believe it is too much like chess. Here is my interview with Yoshiharu Habu at the World Open. There have been a number of blunders in the blindfold today. In Mamedyarov-Aronian, white puts a rook enprise. 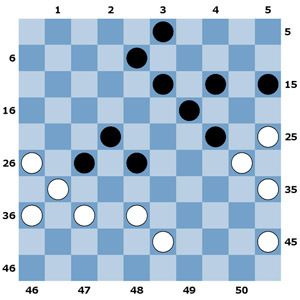 In Humpy-Kosteniuk, black put a bishop on c1 as if to trade bishops, but the white bishop was on b2 already. White simply played Rxc1. In Zatonskih-Stefanova, black left a rook hanging. My contention was correct. I only looked at a few games that had finished quickly, but the report provides more insight into the fatigue of the players during blindfold. I was watching the draughts match between Chizov and Schwarzman and the commentators made a comment about a combination which would have given Schwarzman a winning position. They were referring to 41…22-27! instead of the blunder 41…21-27? Both of these players are former World Champions and Schwarzman was also a champion in 8×8 form of draughts. Apparently, he shouldn’t have missed it. So let’s see this miracle combination that managed to stay undiscovered by two world champions. In the board position, black (Schwarzman) could have decided the match in his advantage by playing: 40… 22-27 41. 31×11 2-7 42. 11×2 9-14 43. 2×19 14×43. 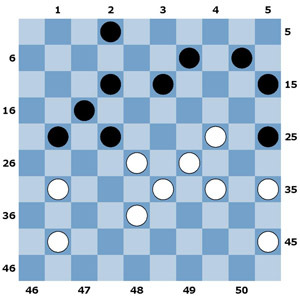 Basically, this combination does nothing more than transporting piece 31 to square 19 and placing a black piece on square 14 in order to be able to conclude the game with a ‘flyover’ towards king. The resulting endgame is one big mess for white who would have done best to just capitulate after the flyover. Maybe a bit hidden, but not a combination of worldclass. Sometimes, even the gods are only human. 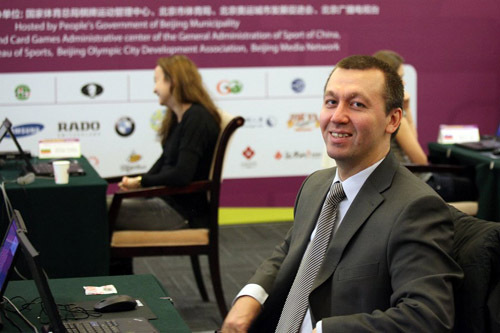 Gata Kamsky (USA)was just out of medal contention. GM Hikaru Nakamura wins three silver medals in rapid, blitz and blindfold! Beautiful combination in the draughts at 03:29:38 by Matrena Nogovitsyna of Russia! With the women, Matrena Nogovitsyna beat Viktoriya Motrichko from Ukraine in the Lehman – Georgiev tie-break from a seemingly passive position. Motrichko in the board position had just played 39… 23-28?in order to defend her advanced piece on square 27. But Nogovitsyna responded with a nasty and winning combination: 40. 38-33! 28×48 41. 26-21 27×16 42. 31-26 48×31 43. 36×29! Spotted Ron “Suki” King of Barbados at the Mind Sports playing 8×8. I did an article on him some time ago.